DugWud is a tangle pattern from Oil City PA’s CZT® Anita Roby-Lavery. Among Anita’s prior contributions to our tangle compendium are the popular Antidots and Hi-Cs. Anita has done a great job of showing us how a physical object, in this case a Dogwood blossom, can be abstracted into a non-objective pattern for Zentangle®. 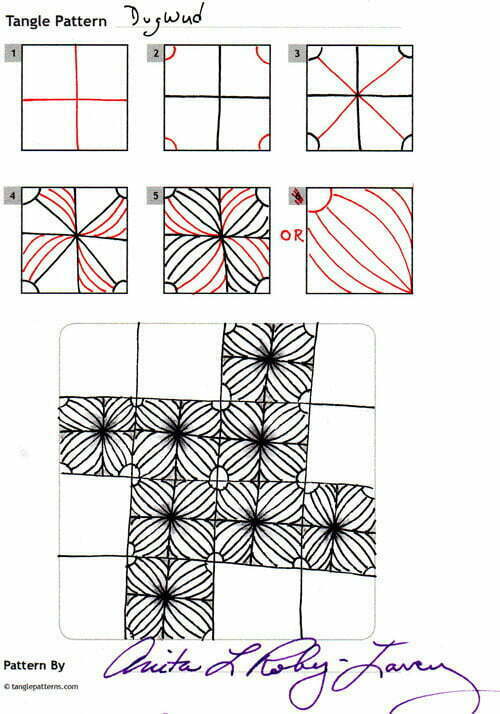 Here are Anita’s steps for drawing DugWud and a monotangle of her tangle, followed by a monotangle using the variation in Step 6 that “reminds me of cicadas–and this is the 17th year since they last came.” As you can see in Anita’s Zentangle below, shading makes a big difference with this tangle. 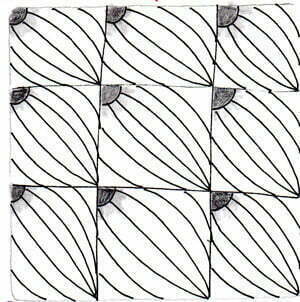 Here’s Anita’s “Cicada” variation in a monotangle using just one block (shown above in Step 6) instead of the four used in the basic DugWud tangle. This variation is similar to CZT Donna Hornsby’s DL Sunray. If you’re interested in learning about the cicada insect and hearing their song, check them out here on Wikipedia where it also provides the enlightening information that “Cicadas are often colloquially called locusts, although they are unrelated to true locusts, which are various species of swarming grasshopper. Cicadas are related to leafhoppers and spittlebugs.” Apparently they’re considered tasty tidbits in some cultures. Aren’t you glad we straightened that out? What a lovely, lovely tangle. Thanks so much! Nifty! It reminds me of Puf (Carole Ohl). What a cool tangle. Looks sort of like a purple onion ( only without the colour unless you add it). Totally awsomer!